More travel for me and another great book. 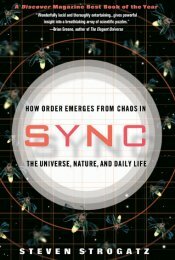 This one is Sync: How Order Emerges from Chaos in The Universe, Nature, and Daily Live by Steven Strogatz. The simplest example, echoed on the book cover, is how do millions of fireflies synchronize their blinking. There is no global “blink now” clock. There is no master firefly orchestrating the performance. So how do the fireflies end up synchronized? It’s a simple idea that requires a lot of thought to truly understand. The problem seems so simple when you first hear it. I would have probably waved my hands at it, mumbled that the solution probably looked like XYZ, and then moved on. Only when you really try to solve it, do you begin to see the depth and subtly of this particular rat hole. Strogatz also discusses many other sync problems: pairs of electrons in superconductors, pacemaker cells in the heart, hints at neurons in the brain, and many others. I was particularly intrigued by his discussion of the propagation of chemical activation waves in 2 and 3 dimensions. 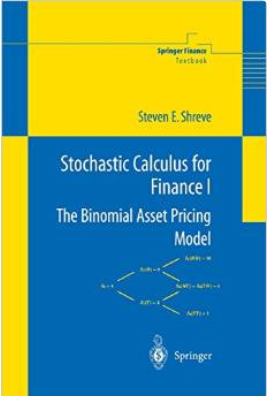 There are no equations in the book, but Strogatz’s prose is sufficient to give a good taste of the novel mathematics he and others have used to address these problems. It was a quick read. As with most books I read, I begin to ponder how I might apply some of its ideas to multiagent systems. For one, there are multiple ties to social networking (the A is-connected-to B kind; not the Twitter kind). I also try to re-imagine his waves of chemical activations around a Petri dish transformed into waves of protocol interactions around a social network. Most of Strogatz’s problems appear to require continuous-space and continuous-time. Most of my multiagent system problems are simpler, requiring only discrete-space and discrete-time. I’ve developed some “half-vast” (say it out loud) ideas about using a model checker to approach protocol problems with sync-like elements. I’d introduce some social operators into the model and an expanded CTL-like expression language. Models would only need to be expanded enough to check the specific properties under consideration. I’d also need to introduce agent variables that range over a group of agents to express the kinds of properties I have in mind. The classic CTL temporal operators are strictly time-like, whereas the social operators would be strictly space-like. Unfortunately, my current ideas could easily cause a massive state space explosion, so I still have work to do. I so love reading books like Sync: books that open intellectual doors and expand conceptual horizons. I expect I’ll be thinking about these ideas for quite some time. This entry was posted in Uncategorized and tagged book, complexity, model checking, multiagent on July 7, 2014 by admin. This is the last in my series on commitments, where we look at what happens when debtors don’t satisfy their commitments. A debtor agent makes a commitment before satisfying the commitment. In fact, that’s the whole point of using commitments. It is a way for a debtor to tell others what it will do in the future. Since debtors are assessed penalties when they fail to satisfy a commitment, they are certainly encouraged to do satisfy. However, bad things can happen between making and satisfying a commitment. To paraphrase Spock in The Wrath of Khan, “There are two possibilities. They are unable to respond. They are unwilling to respond”. 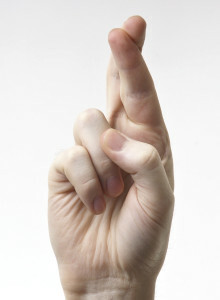 First, a debtor may be unable to satisfy all of its commitments. Toyota had a lot of commitments to deliver automobiles, but when the tsunami hit it, Toyota was no longer able to keep all of those commitments. Second, event considering the cost of penalties, a debtor may be unwilling to satisfy all of its commitments. Airlines knowingly overbook flights, creating more commitments than they can possibly keep. They willing pay the penalties for their broken commitments. This covers the case where debtors originally intended in good faith to satisfy their commitments but it is no longer profitable to do so, and where debtors made a commitment never intending to satisfy them. We don’t distinguish between good and bad intentions in our commitment formalism, because it makes little difference and it is often impossible to distinguish anyway. To model real world situations, we have to allow these messy cases. We can not require debtors to always satisfy their commitments. The only thing we do require is that debtors must not leave their commitments hanging forever. If they can’t satisfy a commitment, then then must eventually cancel it. Commitment cancellation could be triggered by a timeout mechanism. This entry was posted in Uncategorized and tagged commitment, multiagent on July 5, 2014 by admin. Last time, we discussed commitment transformations,. This time we look at a different kind of transformation that captures the idea of a “chain reaction”: where knocking over a single domino causes a whole chain of dominos to topple. Since we assume debtors typically honor their commitments (I’ll have more to say about this in a future post) then unconditional commitments will typically be satisfied and deliver the consequent to the creditors. So whenever the first antecedent becomes true (“fires”), a “chain reaction” eventually occurs and the whole chain of commitment consequents eventually become true (“fire”). The chain reaction may not occur instantly, but if all debtors eventually honor their commitments, the full chain reaction will eventually occur. Further, the result is a commitment from the set of all debtors to the set of all the creditors. The chain is incrementally constructed using a serial composition operator of two commitments. So let’s define it and get those gorpy details out of the way now. This post requires more notation than previous posts. I try to avoid notation, but here its just the simplest approach. I’m using the cool MathJax-Latex WordPress plugin to format this material. This should render in most browsers. Let me know if it doesn’t render well in your browser. The well-defined condition simply means that \(C_B.ant\) must be true whenever \(C_A.csq\) is true. So if the first commitment becomes unconditional and is eventually satisfied, then the second comment will also eventually become unconditional. The transformations in the previous posts never changed the debtors or creditors. Here, the composite commitment unions the debtors and creditors. All the debtors are responsible for ensuring the commitment is satisfied. There are different ways to combine responsibilities. Responsibility can be several (each debtor is responsible for just its portion), joint (each debtor is individually responsible for the entire commitment), or joint and several (the creditors hold one debtor fully responsible, who then pursues other debtors). Serial composition uses several responsibility so that a debtor is never compelled to assume additional responsibilities. The result of serial composition is useful for reasoning about multiple commitments, but all the original commitments must be kept around if we need to determine which specific debtor(s) failed and broke the chain reaction. Serial composition composes just two commitments, but we can use it repeatedly to combine a chain of multiple commitments. To compose more than two commitments, compose from left to right (the serial composition operator is left associative). Enough theory, we need an example. Assume Alice promises to pay Bob some money. If Alice won’t see Bob today, she can pass the money through Chris, a trusted friend of hers. (I refer to this as “pay via middle man” or PayViaMM). There are two commitments. The first is Alice’s commitment to pay Bob. The second is Chris’s commitment to pass on any payments he receives (Alice trusts Chris because of this commitment). Serial composition is well-defined because \(AlicePays \models AlicePays\). Applying the definition above we get the resulting commitment for this chain of two commitments. Just remember this key idea: we defined an commitment operator (serial composition) that creates a single commitment that describes the effect of a chain of commitments. The whole chain is well-defined if firing the first antecedent causes a chain reaction. This entry was posted in Uncategorized and tagged commitment, multiagent on June 21, 2014 by admin. This is another post about using commitments to describe various real-world situations. For thousands of years, mathematicians have used rules to mechanically transform algebraic equations into simpler and more useful forms. Similarly, we can define rules to transform agent commitments into simpler and more useful forms. Let’s extend the pizza example. Assume Alice commits to Bob that she will give him a pizza and a beer if he either gives her $10 or he helps her move to a new house. We can break this single commitment down into a set of simpler commitments. First, Alice will give Bob pizza and beer in either of two situations (an OR operator in the commitment’s antecedent). This gives us two simpler commitments. In some situations, it is easier to work with these four separate commitments so decomposing a complex commitment makes sense. In other cases, we might want fewer commitments, and reverse the transformations, merging simpler commitments into more complex commitments. The key point is once we explicitly describe commitments, we can also define rules to mechanically manipulate them, just like we do with algebraic equations. This entry was posted in Uncategorized and tagged commitment, multiagent on June 6, 2014 by admin. 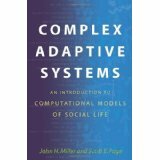 On some recent plane trips, I have been reading Complex Adaptive Systems by John H. Miller and Scott E. Page. The authors discuss a number of topics we all presume we know, but that are seldom explicitly discussed. For example, they have really nice descriptions of modeling and emergence. I certainly can’t recall any specific sources for this material. They talk about “computation as theory”. Formal mathematical methods are certainly a valuable means to understand some theories. But some social systems must have a certain minimal level of complexity before important behavioral phenomena appear. Those models are just too complex for formal methods. Computation is the only way forward. This book is all about how to approach building and understanding computational (agent-based) models for social systems. This book recaps and integrates some material from Wolfram’s A New Kind of Science. That was also a good read. I clearly remember reading that book a decade ago on my backyard patio, bathed in the physical light of the sun and the intellectual light of intriguing ideas. I also thoroughly enjoyed Scott Page’s (same author) Understanding Complexity lectures which address the same topic, in an abbreviated fashion, in a video format. The book is a particularly easy read because the examples are simple and clear, and because they use such interesting expressions and metaphors. (For example, when talking about pixelated pictures, they have this footnote: “For the romantic among you, assume a stained glass window”. I loved that). I also hope to learn a few things about better technical writing by examining the writing style of this book. This entry was posted in Uncategorized and tagged complexity, modeling, multiagent, social on May 16, 2014 by admin. This time we look at two, additional commitment operations: delegate and assign. Commitments relate debtors (the agents making the commitment and the agents who are responsible for satisfying it) and creditors (the beneficiaries of the commitment). But sometimes, one agent makes the commitment, but another agent becomes responsible for satisfying it. At other times, one agent negotiates the benefits of a commitment, but wants to transfer those benefits to another agent. So after the commitment has been created, we may want to change either the debtors or the creditors or both. For example, my Manager makes a commitment to his Executive to do some work and give a presentation on the results of the analysis. Then he delegates this commitment to me. Now, I am on the hook to satisfy the commitment because I’m now the debtor, not my Manager. Note that the identity of the commitment (CC1) is not changed by these operations; it is still CC1 even after being delegated. Now let’s say, the original Executive creditor decides that her manager (SeniorExecutive) really needs to see the resulting presentation instead. So she can assign the commitment, which changes the creditor for commitment CC1. Many papers use the operation delegate to change debtors and assign to change creditors, as I’ve described here. However, in my work, I use the more generic transfer operation to do either delegate or assign. This is just a low-level detail, since both have the same effect. Delegate and assign further demonstrates the flexibility of commitments. Commitments explicitly capture an important type of relationship between agents; they capture something that debtors should do in the future. This entry was posted in Uncategorized and tagged commitment, multiagent on May 9, 2014 by admin. OrderPayShip (the “workhorse“) showed one way to use commitments. In today’s example, I’m going to show a different commitment pattern, which more directly models a legal contract. Both commitments SIMULTANEOUSLY become unconditional only after both Alice and Bob sign the contract. Then both parties have to satisfy their individual commitments. The difference between Workhorse and Legal Contract is more style than substance. This means you can approach problems from multiple directions. This entry was posted in Uncategorized and tagged commitment, multiagent on May 2, 2014 by admin.